In this review, I’m going to compare two Bluetooth speakers from Ultimate Ears and JBL. Until recently, they were the biggest devices available from these brands (JBL Boombox is now the biggest speaker in the JBL family). Let’s compare them and find out, which one is better in such categories as design, portability, connectivity, battery life and, of course, sound. Probably the best way to describe the JBL Xtreme would be to say that it looks like Charge 3, only bigger. It’s noticeably larger than Megaboom, which means that it’s less portable. JBL is aware of this and added a strap for easy carrying. The purpose of the most buttons is obvious, but there is one button that is quite unique – JBL Connect. It is used to sync multiple speakers and play them at the same time. If you have two of these speakers, you can create a stereo effect. Let’s take a look at the back of the device. Here, you will find a bunch of different ports hidden behind the orange zipper. It may be a little hard to get to them for the first few times, but after a while, it will loosen a bit, so the access to these ports will be easier. 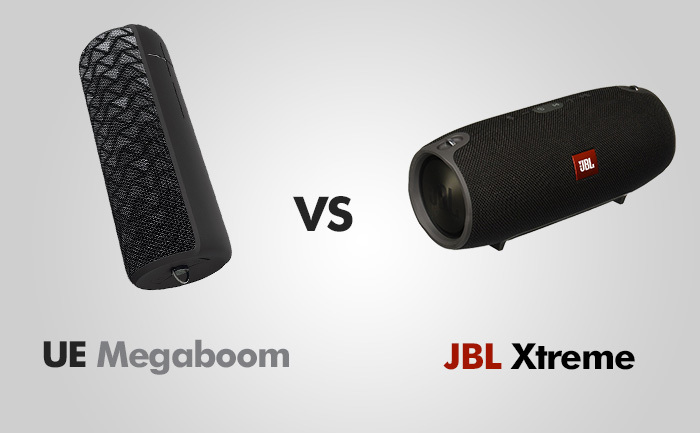 Just like JBL, the Megaboom design is more an evolution from Boom than a revolution. Thanks to its slender design it’s more portable than Xtreme, so you can carry it in a backpack without a problem. It’s wrapped in a special fabric that is resistant to stains and water. There is a rubberized material going from the bottom to the top of the device. Speaker is available in the following color patterns: Black, Charcoal Black, Charcoal Black/Yellow, Electric Blue, Galaxy, Lava Red, and Plum. Contrary to JBL Xtreme, this speaker is designed to stand upright. + and – for volume control. When it comes to water resistance, Xtreme loses not only to its smaller brother, Charge 3 but also to Megaboom. It’s wrapped in a splashproof fabric, giving a nice feel and protecting the device from splashes or rain. The IPX4 certificate means that you can take Xtreme outdoors without worrying about accidental splashes. But be careful not to drop it into the water because this speaker is not sealed completely and the water will destroy the electronics inside. The Megaboom, on the other hand, is fully waterproof (IPX7) and can be submerged up to 1 meter for 30 minutes without getting damaged. The JBL Xtreme has two 63 mm woofers and two 35 mm tweeters which results in an impressive 70 – 20,000 Hz frequency response. Like other JBL speakers, it offers two passive radiators on both sides of the device. Passive radiators are used to amplify bass. It plays very loud so it will be great for an outdoor party. Even if you crank the volume, it won’t distort the sound much. This speaker can handle different types of genres: EDM, Classical, Jazz, Rock. Thanks to large woofers and passive radiators, people who like a ton of bass won’t be disappointed. I didn’t notice any problems with mids either. Mid-range is warm and one of the best I’ve heard from a portable Bluetooth speaker. Treble is good, but if you crank your volume, you may notice a bit of harshness. As you might expect, it offers better sound quality than the smaller Boom, especially at the low end. It offers good clarity and minimal distortion, but sometimes if you push it too hard you can hear it tone down some frequencies to prevent distortion. Contrary to JBL Xtreme, Megaboom offers a 360-degree sound. It means that wherever you are, you can get the same experience from this speaker. It’s especially good in open outdoor areas. Bass was the weakest point in the original Boom, but it’s not the case with this speaker. The lows here are good. It’s not as bassy as Xtreme, but it’s not surprising considering its size. Mid-range is good, and I have nothing to complain about. Highs are the big improvement from Boom. Treble is a bit enhanced, but not to the point of being harsh. Connecting Xtreme via Bluetooth is fast and easy. There were few occasions I experienced a slight signal drop, but these situations were rare, and most of a time the connection was strong and stable. So unless you have a wall or two you won’t have any problems at all. As I mentioned before, there is a button called JBL Connect. It allows you to pair speakers. If you upgrade firmware to the newest version, you will get a JBL Connect+ feature. Now you can connect more than 100 JBL speakers. With Megaboom you may also experience a few dropouts, but these instances are few and far between. The range is quite big – about 100 feet (30 meters). Megaboom offers a great feature for Android phone users – it’s called NFC. You can tap your NFC-enabled phone below the + and – buttons to pair without the need for a menu. You can also connect devices in the wire mode, via a 3.5 mm jack on the bottom. Both apps are free and available for Android phones and iPhones. The JBL offers fewer features than UE app. The new features will be added to the apps via software updates. JBL packed a 10,000 mAh battery into Xtreme, which lasts about 15 hours. 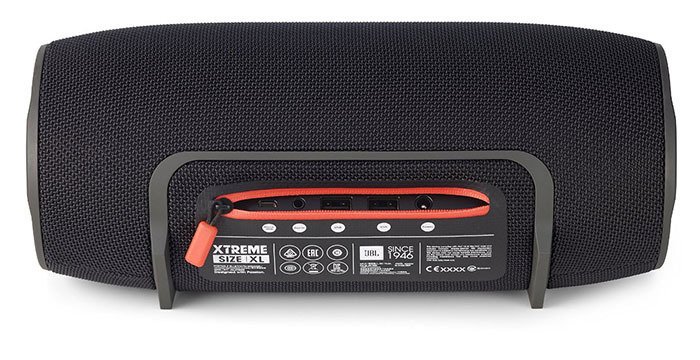 The great feature of the Xtreme is that you can use it as a power bank and charge it via USB cable – a great feature if you are on a vacation, far from civilization and you don’t have a power bank or solar charger. You can charge your phone and at the same time listen to music. It has five LEDs on the front to show the battery status. The UE Megaboom can play music up to 20 hours on a single charge. The speaker also charges quickly. Using the included charger, you can charge the battery from completely empty to full in about 2.5 hours. If you want to check the battery level, press and hold, + and – buttons. The voice will inform you how much battery is left. PROS: Powerful sound / Great bass / Splash-proof / Can sync with multiple devices / Good battery life / Can be used as a power bank. PROS: Great sound / Compact / Great battery life / Good app / Waterproof. CONS: The app offers few features / Not waterproof. CONS: Difficult to charge and listen at the same time / no carrying case included. Both speakers are great, but which one is better? If you want to carry it in your backpack and have 360-degree sound experience – choose Megaboom. If you are more into EDM music and like these punch at the low end, or just need an additional energy source to charge your phone – Xtreme is a better option for you.